A Swiss-French archaeological mission directed by Professor Philippe Collombert from the University of Geneva has unearthed a large granite pyramidion, or pyramid peak, probably belonging Queen Ankhnespepy II, in the Saqqara necropolis. This is the second discovery in a week by the Swiss-French mission, according to the secretary-general of the Supreme Council of Antiquities, Mostafa Waziri. The team previously unearthed the largest obelisk fragment ever discovered from the Old Kingdom, measuring 2.5 meters tall. This week's discovery measures 1.3 metres high and 1.1 metres wide on its sides. Its upper part is partly destroyed, but shows that it had been covered by metal foil, either gold or copper. “The surface of the pyramidion’s lower part is not clean, as if it had been reused, or better, as if it had been left unfinished,” Collombert pointed out, adding that the area under the pyramidion is clearly smooth, and also shows the usual carved recesses that permit its fixation of top of the pyramid. “We think that it is the pyramidion of the satellite pyramid of Queen Ankhnespepy II, as it was found near the place where we should expect the satellite pyramid to have been located,” Collombert told Ahram Online. 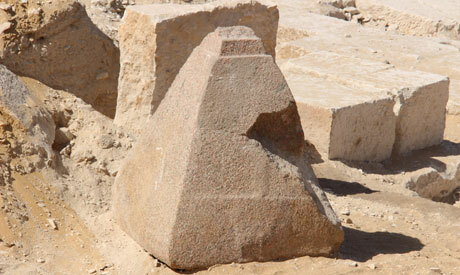 He asserted that this fragment comrpised the only part of this secondary pyramid yet to be found. The queen's main burial pyramid was discovered in Saqqara in 1998. The Head of the Ancient Egyptian Sector at Egypt's Ministry of Antiquities, Ayman Ashmawy, said that the mission is progressing well this archaeological season, and that the new discovery suggests the team will soon locate the queen's complete funerary complex. Queen Ankhnespepy II (ca. 2288-2224 BC) was a 6th Dynasty consort of King Pepy I and the mother of King Pepy II.